Morales, a fine arts graduate and DACA recipient, took inspiration from Latino artists and a poet in developing her style. In a white-walled studio lit by an opaque skylight, UW graduate student Arely Morales rendered her MFA education into three imposing, radiant portraits of Latino laborers whose humanity will not be overlooked. In “Juan Jose, 2017” a man smudged with dirt and fatigue fixes a long stare as he balances a heaping tub of tomatoes on his shoulder. In “Guadalupe, 2017” a sweating woman with a solemn gaze stands against a background of orange and yellow Huichol designs, her dress echoing the patterns and colors. In “Arely, 2017” an apple picker standing between a basket of apples and a line of trees holds up her wrapped and bloodied hand, either covering or uncovering her face with a protective kerchief. A Mexican-sky blue and each subject’s unapologetic gaze tie the 5-foot-by-5-foot paintings together. They are stunning statements about Mexican and Central American people who migrate north to work in grueling environments. Especially enveloping is the apple picker, for whom the artist used her own likeness. She has never been a farmworker but she is a Mexican immigrant—a DACA student in the era of Trump—who honed her artistic voice at the UW by telling the stories of people from Latino cultures. 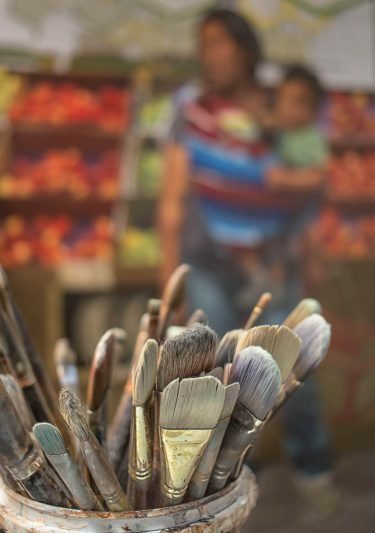 Some of Arely Morales’ paintbrushes in her Seattle studio. Behind them is a painting in progress. The striking portraits represent two years of transformation for the 27-year-old artist whose work moved from literal to symbolic, dark to bright (think Caravaggio to Kehinde Wiley) and from culturally nostalgic to socially pointed. UW Professor Zhi Lin, whose own recent artwork centers on reinserting Chinese railroad workers into the U.S. historical narrative, said Morales’ work is not politically militant, “because ‘militant’ becomes a poster.” But she came to the UW with something to say and left saying more, more clearly. Morales graduated with honors from the School of Art + Art History + Design in spring, earning the department’s de Cillia Graduating with Excellence in Research award. She is now in Nacogdoches, Texas, teaching drawing at her undergraduate alma mater Stephen F. Austin State University. The paintings evoke the same emotions that compelled Morales to elevate her subjects in the first place, emotions fed especially by the work of Los Angeles-based artist Ramiro Gomez and the poetry of former U.S. Poet Laureate Juan Felipe Herrera. Morales immigrated to Texas from Tlajomulco de Zúñiga, Jalisco, Mexico, when she was 14. “Tlajomulco” is translated from the Nahuatl as “town in the corner,” but Morales said everyone there translates it as “town surrounded by mountains.” Seattle—distantly ringed by the Cascade Mountains to the east and the Olympics to the west—reminds her of her birthplace. The mountains and the rain. But she wasn’t always comfortable in Seattle, artistically or personally. “There were times when I was a little depressed and guess it reflected in what I was doing—my paintings were really dark and gray and I felt like I didn’t know who I was at some point,” she said. Arely Morales with studies from “Guadalupe,” the oil on canvas behind her. Back home in Texas, Morales intends to continue her research in the fields and with workers in their environments. She’s also interested in exploring her own experiences with subtle and overt racism, perhaps a perilous endeavor in conservative Texas, especially compared to liberal Seattle. Here she found a receptive public for her work. “I am a little worried about how things will go in Texas,” she said as she was about to roll up her canvases for the journey back to Nacogdoches. Yet, as she summed up the key points that will propel her to the next phase of her life, she focused on what she has to offer her students, especially how to turn challenges into artistic, personal and professional growth. “I know more who I am today because I had to explain myself so many times to my professors,” Morales said. “I used to feel insecure about speaking English, but here I overcame the fear of being different. I am not a citizen, but I still can feel things and say things. To see one of Morales’ paintings in person, head over to the HUB this fall. Andrea Otanez is the guest editor of the Fall 2017 issue of Viewpoint Magazine. A former assistant metro editor at The Seattle Times, she is a lecturer and the journalism-program coordinator in the UW Department of Communication.